Savings will need to be found in state government spending in order to achieve tax cuts in the near future, according to Lt. Gov. It’s good that they’re having the discussion about what we ought to do. I think a lot of good ideas will come out of it. The degree to which we can lower taxes will depend in large part on how much savings we can find. The savings are the key. What you’re doing then is you’re creating a government that runs better but costs less to run. For an example of tax reform gone wrong, one need look no further than Kansas’s recent attempt at tax reform that featured tax cuts (good!) but no reduced spending (bad!). Kansas also never got around to eliminating loopholes in the tax code. If tax reform and relief is going to happen in Arkansas, it won’t be through legislators emulating the Kansas model. The way you get to that and have the flexibility to lower taxes, rearrange taxes and do all that the way you really want to do it…the way you get there is you’ve got to find savings. If government is spending what government is taking in, then there’s no surplus money to lower taxes with. 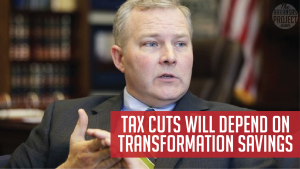 Transformation is the key that unlocks the door to tax reform, highways and infrastructure…to whatever it is that you think money should be going to. We’re spending extra money to do things the old way. While there’s a lot of work left to do on this front, there has been progress made by state agency heads in recent years. Many state agencies have found ways to root out inefficiencies and reduce staffing while meeting their obligations to the public. This has led to significant taxpayer savings. For more on this topic, read our previous four stories about these efforts.